The Resonance Plugin generates all resonance structures of a molecule. 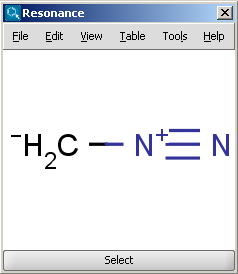 The major contributors of the resonance structures can be calculated separately. As an example see the two structures below: the major resonance contributors of diazomethane, while the structure below them is its canonical form. Max. 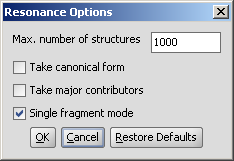 number of structure: maximize the number of structures to display (decrease calculation time). Take canonical form: displays the canonical structure of the molecule. Take major contributors: selects the most relevant structures. 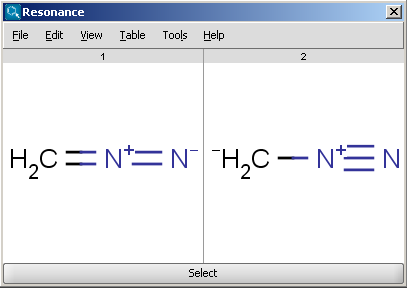 Single fragment mode : if checked (default), the results are displayed in separate windows; otherwise the calculation handles unlinked molecules together and the results appear in the same window.